March 1 – The Tier II deadline is days away! The deadline to submit Tier II reports is March 1. Hopefully, you have all of the necessary data complied, but are you sure you know how to submit your report, to whom, and if you have to submit fees? Section 312 of the Emergency Planning and Community Right to Know Act (EPCRA) requires facilities storing hazardous chemicals above certain thresholds to submit an annual inventory of those chemicals to the State or Tribal Emergency Response Commission (SERC/TERC), the Local Emergency Planning Committee (LEPC), and the local fire department with jurisdiction over the facility. 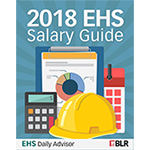 Tier II information provides the specific amounts and locations of hazardous chemicals present at the facility during the previous calendar year. This information allows emergency planning and response personnel to be adequately prepared should an incident occur at the facility. Most states require electronic reporting using either EPA’s Tier2 Submit software or a state-specific online reporting tool. In some instances, submission using an online tool satisfies reporting requirements to one or more of the SERC, LEPC, and local fire departments. However, in many jurisdictions the submission requirements are different for each entity. 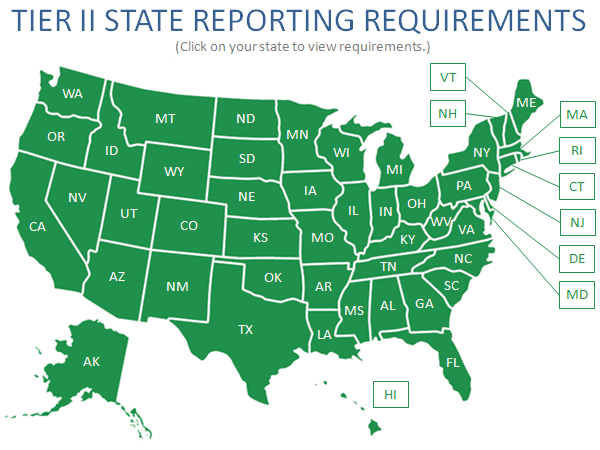 What are your state's Tier II reporting requirements? To help your company comply with EPCRA, we have created this interactive map to direct you to your state’s Tier II reporting requirements and contact information. For federal information, see the Community Right to Know topic.